Caroline has been working for Falklands Conservation since October 2016, initiating a multi-faceted field research project on sei whales (Balaenoptera borealis) in the Falkland Islands. Although typically encountered in deep, oceanic waters in many parts of their ranges, the Falkland Islands appear to represent a shallow, shelf feeding ground for sei whales during the austral summer and winter. The most recent field report from the sei whale research has just been published, and contains a summary of research activities carried out during the first systematic boat-based survey of sei whales in the westernmost part of the Falkland Islands between the 22 February and the 4 April 2018. This work included a visual sighting survey, photo-identification, faecal sampling and behavioural focal follows. A total of 1,342 cetacean sightings was recorded during the survey, confirming the occurrence of four species: sei whale, killer whale (Orcinus orca), Peale’s dolphin (Lagenorhynchus australis) and Commerson’s dolphin (Cephalorhynchus commersonii). Sei whales were the most frequently-sighted species, with the majority of sightings consisting of single animals (53.8%), or small groups of two to three animals (38.8%). A total of 147 individual sei whales were initially entered into the photo-identification catalogue (prior to rigorous quality control). 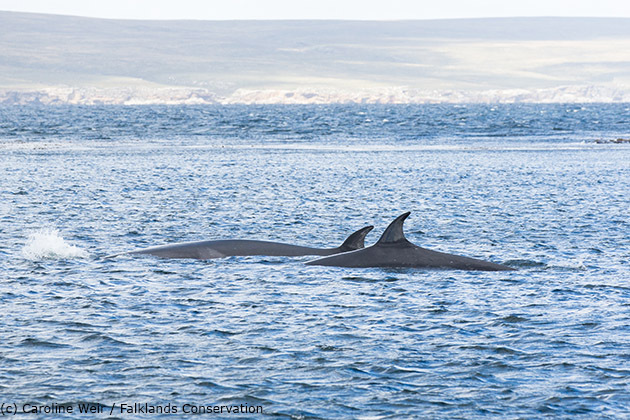 We documented two re-captures between sei whales that were photographed in Berkeley Sound (East Falkland) during 2017 and were then re-captured off the west coast of the Falklands in 2018. These records confirm that individual sei whales return to the Falkland Islands to feed in successive years, and demonstrate linkage between the sei whales on both sides of the Islands. Weir, C.R. (2018). A preliminary assessment of endangered sei whales (Balaenoptera borealis) in two candidate Key Biodiversity Areas in West Falkland. Falklands Conservation report. Version 1.2, 3 September 2018. 128 pp.